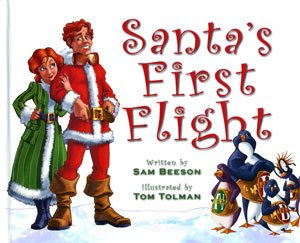 Santa's First Flight is a silly, quirky story of young Santa's troubles when he ventures out for the first time. The clever rhymes tell of nervous, frightened townspeople who set up precautions against this stranger, and of Santa's subsequent kind persistence. Creative, giggle-inducing, and a surprising (but very welcome) message of goodness, grace, and generosity...my kids love this new addition to their Christmas book collection. Tricky to find, but you can buy it here and here.